There’s nothing quite like the smell of bacon in the morning. It’s the kind of smell that will wake you up if your tired and will make your tummy start to rumble before you even realize you’re hungry. Bacon is a staple in our household, whether it’s for breakfast, lunch or dinner. To celebrate International Bacon Day, we were happy to cook up some bacon and enjoy each and every crispy bite. If you’ve watched any episodes of Top Chef or Chopped, you’ll soon notice that bacon seems to be one of those ingredients that chefs love to add. Whether it’s to some leafy salad or a fancy saute, bacon makes everything better. We use bacon with our hot dogs, on top of burgers, and on top of salads. For International Bacon Day, we cooked up some Smithfield Hometown Original bacon for breakfast. 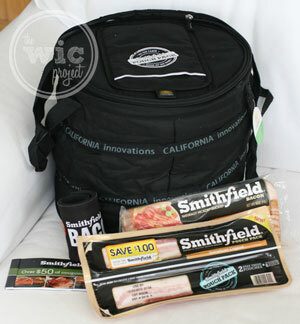 If you just want to cook up a few pieces of bacon at a time, the Smithfield Pouch Pack makes it very convenient. It has 2 individual pouches that each have 6 slices of bacon. We go through quite a bit of bacon so the regular pack works for us too. Now there are quite a few ways you can cook bacon. I suspect most people use a frying pan to cook their bacon. When you’re short on time, you might nuke a couple of strips in the microwave, and for those who are a little more patient, the oven is the way to go. While I cook bacon using any one of the methods mentioned, I think I prefer oven-baking. This seems to be the easiest way to cook a lot of bacon and have them all come out perfectly. I use two wire racks inside a cookie sheet so that all the bacon fat can drip off the bacon. 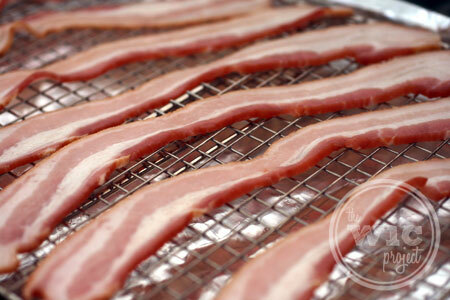 Simply lay the bacon across the wire racks and then bake them for 17-20 minutes in a 400F degree oven. Some people say that you can start the oven cold and put the bacon in, letting it cook as the oven heats up; I have not tried that technique yet. As I mentioned, the oven-baking method is for those who can wait the extra time to allow the bacon to cook, but I assure you it is well worth the wait. 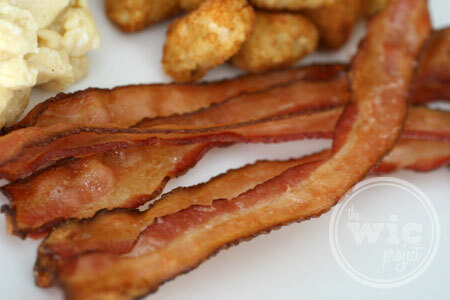 The bacon comes out just right – crispy but not over cooked and with great bacon flavor without cooking in it’s own fat. Add some scrambled eggs and some tater tots and you have yourself an awesome breakfast. I hope you’ll join Smithfield and me in raising a strip of bacon in honor of International Bacon Day! 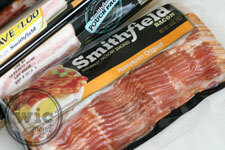 You can find Smithfield bacon in the breakfast meats section in grocery stores nationwide. 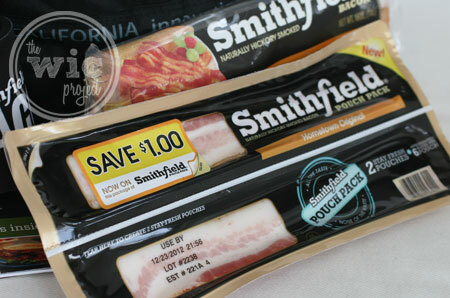 One winner will receive a Smithfield prize pack which includes: Smithfield’s popular Pouch Pack bacon and Hometown Original bacon, as well as other bacon-themed items including a notepad, koozie and Smithfield bacon coupons. I LOVE crispy bacon on a BLT! I eat my bacon wrapped on fresh asparagus grilled in the oven YUMMY!!!! I am a huge fan of bacon! I use it for so many dishes because it makes everything taste better. Awesome giveaway <3 I have to say… Bacon is sinfully yummy <3 BLTs are AWESOME! bacon egg and cheese toasted on a bagel. bacon and scrambled eggs with toast! Yum! I love bacon with everything,,,, especially mac and cheese!!!! My favorite is just a plain old BLT! plain old BLT sammies are the best! I love this give away and would love to win! we eat BLT’s and bacon for breakfast every weekend. straight outta the pan. It never makes it far from the stove before disappearing. I love bacon almost any way you can fix it! But I LOVE it crispy!! … for breakfast or a BLT!! I love to put bacon in my meatloaf!! I love to put bacon on salads!! I love bacon in any shape or form! I love bacon in my salads and with my eggs, pancakes and toast! With hasbrowns and scrambled eggs in the morning. Love bacon.. BLTs, bacon and eggs. Yummy!!! I like to use bacon on my cobb salad. A spinach, mandarin orange and bacon salad is my ALL time fave! Nothing beats a good ol BLT with tons of B on it! I love bacon with biscuits and gravy!! I eat my bacon with 2 eggs sunny side up & 2 slices of toast. I fry my bacon and eat it with abandon! I like it on sandwiches, in salads sprinkled on eggs. I love bacon! I love bacon, by itself, in a BLT, double bacon potato salad, the list goes on…. Bacon is my favorite bacon dish. We have 5 kids, so we are always making a lot of bacon at once. We cook it in the oven ( a trick hubby picked up in the military) and it frees up stove space for the rest of breakfast, plus the smell of it cook usually wakes the kids up and lets them know breakfast is ready. I eat bacon morning, noon and night!! Favorite thing to do is wrap little smokies in bacon and roll in brown sugar then bake til crispy!! Second fav is I crumble it up and mix into my biscuit dough in the morning along with shredded cheese and chopped onions/garlic–my family can’t get enough! BLT’s are a fav as well as putting it in every casserole, pasta dish, and the perfect pizza topping!! mmmm!! Right now BLT sandwiches with fresh garden tomatoes! I love having bacon with scrambled eggs, or on a cheeseburger. I love scrambled eggs with bacon in them. I fell in love with the fried green tomato BLT sandwich. It is loaded with bacon and the tomatoes are browned in bacon grease. I like bacon with pancake. I love bacon on a bagel with egg and cheese! We use bacon in a lot things! We like to cut it up to put in re-fried beans and also crumble on top of twice baked potatoes! You can’t go wrong with a homemade bacon biscuit! I love to eat bacon sandwiches or just eat it with eggs and hash browns. EVERYTHING is better with bacon,ok maybe not ice cream…but well maybe,lol,we use bacon in so many things,but one of the simpliest is a good BLT but I have been known if the tomatoes are not good to just have a bacon sandwich in a hurry! I like bacon fried in the skillet with a side of scrambled eggs/with cheese. love bacon straight up, with breakfast, on a blt, grilled cheese, with pasta, not sure I’ve had it where I didn’t like it…there’s a farmer’s market near me that sells it chocolate covered–haven’t bought it…there’s a blog devoted to bacon, too. I like bacon any way I can get it. With eggs, BLT sandwiches, on cheeseburgers, alone. I love bacon all by itself, but wouldn’t turn a good BLT away either. I like my bacon in food or separate but when it is separate it needs to be soft but crisp on the edges. I love bacon with eggs, or mushrooms stuffed with bacon and cheese! I love bacon and eggs with toast in the morning and leftover bacon and tomato sandwiches for lunch. I love bacon with eggs or in BLT’s. I like bacon in my clam chowder. Happy International Bacon Day. BLT’s. I like my bacon wrapped around a filet. I like bacon with eggs and toast. I love to add bacon to my hamburgers. And of course alway love it with scrambled eggs and pancakes 🙂 Ok now I’m getting hungry. lol. How DON’T I eat bacon! I like it floppy not crispy. Love adding it to Cheesy Hashbrown bake. i love bacon by itself. even if i eat it with nothing else. i don’t really like adding it to anything. I love eating it with scrambled eggs. I love me some bacon!! My favorite is the BLT. I like it on a bacon and egg sandwich. I’m vegetarian! 😛 But I’d love to win this for my Dad! He loves bacon! Cripsy bacon on a homemade cheeseburger! gonna have to say blts! I love bacon in bubble and squeak. I love blts, I do thin that bacon makes everything better though! and maple bacon wrapped scallops….now im hungry! They make dishes out of bacon.. I’ve got to get me one of those. No anything you put bacon on is my favorite!! I like my bacon on a blt!!!! The list is long long …. I love bacon/egg breakfast sandwiches. I love BLTs. I love crumbled bacon on a salad. bacon good. bacon yummy. everything tastes better with bacon. in order to get my nephew to try new foods we tell him it is bacon. luckily he is a sweetie and has never gotten mad because it turns out the new food is not bacon. he has a great sense of humor. We love bacon!I love to use it in casseroles,pasta salads as well as the obvious like breakfast,gravies and BLTs 🙂 Thanks for the chance! I like to crumble bacon in our pancake batter. I like bacon on everything – sandwiches, with eggs, wrapped around steak or chicken. Haven’t tried it with ice cream yet but I hear it is good! I like bacon in Quiche. I love to eat Cabbage & Bacon. Simple but tasty! I love bacon with pancakes and lots of maple syrup. Drool. As a crispy addition to a BLT sandwich. I enjoy my bacon by itself as long as it’s thick and cooked to perfection! I like my bacon thick sliced and not too crisp. I’ll eat it with nearly anything, eggs, pancakes, burgers, on salad. LOVE IT! I love cutting my bacon in tiny pieces, and adding it to my scrambled eggs. I love to bake my bacon, I love it on fries, *clears throat* on my salad, in my baked beans, its one of the most versatile meats, Its a shame I didnt start like bacon until I reached my 30’s Im 40ish now LOL! Well, it used to be on a bacon, egg and cheese bagel, but now it is CHOCOLATE COVERED!!! YUUUMMMYYY! I love bacon sandwiches or just plain ole bacon and eggs. My favorite is a BLT! However, I also love bacon on a burger, hot dog, salad, just about anything. It is so good and so versatile. I usually just fry my bacon & have it for breakfast as a treat! Fav is blt with no l.
I love bacon on everything! Crispy bacon atop a chicken salad sandwich. I love just plain ol’ bacon very very crispy! The only time I eat bacon is with waffles or pancakes or in a BLT. I like it cooked slowly so it’s chewy…not too crispy. i like crispy bacon and i like it with everything, eggs, hamburgers, potatoes, salad…etc. I’ll eat bacon anyway I can get it. On pizza, burgers, in omelettes. I lie bacon on almost everything! I missed international bacon day — but I celebrate today by making perigees fried in bacon and onions.!!! I’ve got a great Alice Springs Chicken dish that I love that has bacon! The crispier my Bacon the better. I love BLT’s with sliced black olives o them and Bacon cheeseburgers with cheddar cheese. I like my bacon crispy. I like it on top of cheese burgers,Grilled cheese and Bacon, Bacon and eggs and BlT sandwiches. I just love Bacon! i like to eat my bacon by wrapping a water chestnut up and making a brown sugar sauce to put on it as little appetizers! Twice Baked Potato Casserole and BLT Pasta Salad!! I love cooking Bacon Cheeseburgers! I love bacon plain and in stuff. My favorite dish would have to be one of my casserole dishes that i throw together. Yummy!!! Bacon & egg burritos the best!! BLT best sandwich in the world. I love bacon! Eat almost everyday. Thanks and good luck to all! We like our bacon limp (we call it gaggy) when we eat it just plain, but a little crisper when we have BLT’s or club sandwiches. I love bacon just about everyway there is to eat it, except raw of course! Bacon fried, microwaved, or oven baked is my favorite ways to eat bacon. I use it in beans, casseroles, etc. You can never go wrong with bacon! must be burned and crispy! I love bacon anyway it is served, even dipped in chocolate……..A Piece of Meat and Something Sweet!!! Go Hogs!!!!! Thanks for the giveaway….. I have tried the “Baking Bacon” and it is the BOMB! Smithfield is the favorite at our house! i love all bacon. it just go’s with everything. love Bacon!! in salad, wrapped around chicken, blt’s…. yum! My family loves our bacon with breakfast for dinner, plain and simple cooked bacon. We love bacon dishes but in hour house the bacon is usually gone before I can do anything else with it. We have been known to wrap steaks in it years ago. plain fried up in a pan. thank you i love bacon!!!!!!!!! I like bacon on sandwiches, for breakfast and in recipes. I love it on turkey that I bake for Thanksgiving. My favorite is Bacon Cheddar Quiche with hashed brown crust….it is savory and so delicious you can devour the whole pie! I love bacon with just about everything. I put bacon on my bacon. Bacon sandwiches or just plain bacon. I love all bacon dishes. Tried a bacon shake….turned out to be really good! My favorite way to eat bacon is just by itself. Even eating it cold is good. Love it on everything!!!!!! Nothing better than a good ole BLT sandwich! Love bacon on BLT’s and just to munch on. Also you it on 3 layer salad. I eat bacon any way at any time. I’ll eat bacon just about any way but raw!! I like to eat bacon at breakfast with eggs and biscuits! I love, love, love bacon. I eat it fried and can eat it all day. I eat bacon with everything!! I like it on a BLT. I love bacon any way I can get, like on a big fat cheese burger. Bacon make’s every thing happy. I am currently enjoying bacon with lettuce, mayo and toast. I love bacon and BLT’s are my fave! My family loves bacon and egg burritos! our kids love bacon prepared right on the griddle. It’s messy…but we all love it. Thanks for the chance to win! Mmmmmm… Bacon…. it’s the love of my life! Isn’t it everyones? We love BLT’s at our house! I love bacon crispy pretty much on everything! with eggs, homefries and some carmelized onions!!! YUM!!!! I love bacon all by itself. I love bacon with my eggs at breakfast, bacon bits on my salad, bacon lettuce and tomato sandwiches, bacon bits on my baked potato, bacon cheeseburgers, OMG I love bacon! Blt’s and just bacon with pancakes and syrup! I make Tokeyo Pancakes with lots of bacon!!! I love bacon and tomato sandwiches. I usually eat bacon with steamed-rice!!! I love bacon turkey ranch wraps! Bacon goes great in ALMOST anything…nom nom nom!! I love BLTs, crumbled bacon in salads, cooked for breakfast, sauteed with onions to start a soup, etc etc etc. Love love love bacon! I make waffles, egg, cheese, and bacon sandwiches! yum! Usually, on weekends, it’s just a couple of rashers with scrambled eggs. But, when I’m lucky a friend at a corporate hospitality has apple bacon that’s the best. I eat my bacon any way I can get it. I love bacon in, on, with or without eggs. I love bacon for any snack or any meal. I just love bacon. I eat it as a BLT. When nothing is left in the house I love to sneak that in. Would love to win this:)Thanks for the chance. I love my bacon crispy and I love it in all kinds of dishes…… bacon sandwich, crumbled in potato soup and on baked potatoes and sometimes just righ out of the skillet as a snack! I like it warm just out of the pan!!!Yum! I love bacon crispy! Loaded baked potatoes, breakfast burritos, chicken wrapped in bacon and covered in mozz, however I can incorporate bacon into a meal I will! I bake my bacon until crisp. I love bacon in a turkey club sandwich. Then we do a chicken breast recipe I found in kraft foods that has bacon bits that is great, too. I love bacon in or on anything… one of my favorites is bacon brownies YUM! With eggs and toast, blt’s, quiche’s, on sandwiches my favorite is with sliced pear and jalapeno jelly on toast yummo. We or should I say I have bacon every day. I never use to eat breakfast but apprx. 20 years ago got sick and still am will always be 3 years ago i was hospitalized due to my weight being under 100 and losing a pound a day, well recovered that-turned out -infection. But since that day I have had a good breakfast. Bacon helped me get back to myself. Bacon everyday! I Love bacon anyway it can be made,crispy, or over easy,I LOVE BACON. BLT no need to say more. Love Bacon! I have it with eggs, as:salad, BLT,baked potatoes with Bacon and cheese. It is great in a casserole and even a cupcake! I like bacon on burgers and turkey club sandwiches. We often have pancakes with bacon for supper- very filling! I make an egg, cheese, and bacon sandwich. I absolutely love bacon wrapped shrimp! I love bacon with eggs and I like quiche with bacon in it. We like bacon in a breakfast casserole. I like it as a side and even in whiskey glazed meatloaf. I like my bacon crisp but not burned. I love it just by itself, on BLTs, in casseroles, on salads, on burgers and more. My favorite way to eat bacon is right out of the pan. I like my bacon crispy in a blt. love bacon anyway but especially in my quiche Lorraine! I love, love, love BLT’s. First let me start off by saying: I ONLY buy Smithfield Bacon. I do not buy any other brand. My favorite dish I make is Chicken Bacon Ranch Sandwiches. My Husband loves them. I love to eat my bacon in the form of a BLT. Nothing better than that! I love bacon every way! We eat it in mashed potatoes, scrambled eggs, on sandwiches! I love bacon, spinach, tomato and avocado sandwiches and also stuffed jalapenos wrapped in bacon and either grilled or baked these are two of my favorite ways with bacon. we love bacon for any meal of the day! I love bacon! Anyone that knows me at all knows this…this prize is perfect for me! 🙂 Thanks for sharing! I love BLT’s or bacon on top of my cheeseburgers. Thanks so much for hosting this great giveaway! I love bacon on my cheeseburgers, in my salad, as a great BLT anytime of the day. Great giveaway and thanks for the opportunity to win. I love BLTs! I also like to drape bacon over my meatloaf. I really would probably eat bacon with just about anything. I love bacon really, really chewy. I also love to cook bacon and mushrooms together….leaving chewy,add fresh string beans with garlic, salt, and pepper. Yummy! I even love BURNED bacon!!!!!! My family loves bacon anyway I cook it.I do enjoy fixing a great BLT sandwich. i love bacon,i eat it anyway way everyway i can! I like bacon for lots of different things, I like to eat it plain, but I love making “breakfast skillets” (and not just for breakfast) bacon, eggs, potatoes, and cheese, all cooked up together. 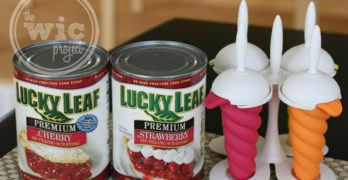 Its so yummy, and the bacon makes it. I like my bacon plain! Nummmmm- Bacon for BLT’s – send it my way please Paula! I eat my bacon crispy. I love bacon but my son REALLY loves bacon !! He can sit down and eat a pound by his self !! I love Bacon, Lettuce and Tomato sandwiches. I love bacon on grilled cheese! I just like my bacon fried crispy and on top of an egg between buttered toast!! blt sandwhich!! and on burgers! on a blt and nice and crispy! I love bacon any way you can eat it. My all time favorite has to be BLT’s! I love bacon! Especially crumbled in my potato salad! O I do love my bacon, I fix it up nice and crispy with some eggs and biscuits. Wrapped around asparagus is my favorite way to eat it!!! I Love Bacon,Lettuce and Tomato sandwiches!!! We dip bacon in orange juice then dip in brown sugar and bake it in the oven. It comes out sweet and crispy. I like bacon, in between chewy and crispy, but my daughter is the real bacon fanatic. She would eat it all day every day, and she loves it when it has “bouncies,” so she prefers it on the less-cooked side. We are bacon FREAKS! We love to eat bacon straight and also wrap it around dove or whatever kind of meat we might be cooking for dinner. Our favorite thing is to cook it crispy then crumble it over a homemade pizza as one of the toppings. Really Really good! Favorite bacon dish is a BLT with fresh summertime tomatoes. I love Bacon Can’t wait to Enjoy Try With Family & Friends. I love bacon on my baked potatoes! I like bacon by itself and on everything!!! In a fatten macaroni and cheese bacon adds just the best favoring. I swear I can taste a BLT right now, using our garden tomatoes. Yummy!! I love crispy bacon my burgers. Thanks for the chance. I love my bacon about half done. It is so good. I like bacon on burgers, blt’s and peanut butter sandwiches. I love my bacon very crispy and broken up in my scrambled eggs with some cheese. Yummy!! I love a BLT on a roll! BLT!!!! that is our favorite…. I love bacon all by its lonesome self! My favorite way to eat bacon is bu itself. We also use it in soup, on potatoes, in sandwiches, and many other ways as well. I love bacon on nearly everything!! My favorite dish is a garlic/herb rubbed pork loin wrapped in bacon and baked. I just like to eat it on the side with eggs. I love eating a bacon sandwich in the morning for breakfast. Crispy bacon between two buttered pieces of toast. I LOVE bacon and enjoy it so many ways. With eggs at breakfast, on burgers, on egg salad sandwiches, blt’s, on baked potatoes, etc. Bacon makes everything better! Salads, veggies, sandwiches, yum! I like to keep it classic with the BLT! I just love bacon! Especially real crisp, & hot! Pretty much any crisp bacon is good bacon! But I definitely love it crumbled in scrambled eggs with cheese! i just love it on pizza or by itself. I love it mixed into green bean casserole. Thanks so much for the fantastic giveaway! Love bacon! Cooked for breakfast, mixed in with an omelet or scrambled eggs, tossed in a salad…yummm! Awesome just by itself and stacked high on a BLT! I love to eat bacon plain. 🙂 I do use it on and in many things. I love adding it to my sandwiches. We eat bacon all the time in our home. My favorite bacon dish is wrapping it around a steak and BBQ it. I love bacon with my scrambled eggs and in my BLT sandwiches! We lover bacon wrapped jalapen poppers ! Especially with Smothfield Bacon ! I like it not so crispy, and in just about everything! I love BLT’s. My favorite is bacon and mayo sandwiches with fried eggs. I love to make BLTS. I like my bacon on a nice blt sandwich. I just made mac and cheese with bacon last night! I enjoy bacon in a BLT. We love to eat Bacon with our eggs. you cannot make a good chowdah with starting out with BACON! I love crumbled bacon in my salads – Thanks! bacon in our fresh green beans. I love crispy bacon for breakfast! I put bacon in quiche,wrap it around steaks,porkchops, have a delicious BLT…Bacon can be used in SO MANY different recipes,its amazing! I like my bacon very crispy! I like my bacon crisp. BLT is a favorite for me. I eat bacon any way possible! It even creeps into my healthy dishes, like salads and baked potatoes! my favorite is a BLT! I love bacon with pancakes. My favorite way to eat bacon is on a ham & swiss, but I also like it with eggs and toast! BLT’s, or bacon/egg/cheese on an english muffin. I like bacon in any way, shape, or form! I don’t discriminate! Anything with bacon in it is awesome – BLT’s, toast and bacon, bacon with eggs. As long as it is crispy I will eat it!!! I love BLT’s, bacon on salads, bacon wrapped steaks and chicken on the grill. Any thing with bacon is yummy!! Fresh green beans with bacon and potatoes! Our favorite dishes with bacon are either bacon egg n cheese breakfast burritos (at home of course) or fried potatoes with bacon (yummy). I love any breakfast with BACON!!! Oh and baked asparagus wrapped in BACON!!! Thanks for a great giveaway! My fav bacon dish is 8 8″ pieces of bacon woven together into a square with eggs, cheese on toast. LOVE Bacon. My favorite is a BLT. I like bacon wrapped scallops! The best way to eat bacon is PLAIN! I will have to try in the oven…at what temp for how long? My daughter and I love just frying it up and eating it plain. Sometimes we’ll make bacon sandwiches but usually, just bacon. I love Bacon Cinnamon Rolls are sooooo delicious. Bacon with asparagus green beans,okra and tomatoes. I like crumbling up bacon in my soups. I like it soft, not crispy. My favorite is a bacon potato soup. I love bacon in loaded potato skins! Nothing like a loaded potato skin with cheese & bacon! BLTS! Yumyum. Especially with my homegrown tomatoes! I like bacon wrapped around filet mignon. YUM! I love BLT sandwiches, but I only eat them during the summer when I can get local fresh tomatoes. The rest of the year the tomatoes just ruin the sandwich. bacon wrapped scallops – delish! Thanks for the giveaway…love crisp bacon with pancakes. We love having bacon cut up with scrambled eggs and cheese! yum! Of course we have the good ole BLT as well! Thanks for the giveaway!